MINNEAPOLIS, MN -- Thank you to Ace in the City (AceInTheCity.org) for inviting LogiSolve to their Fellowship Dinner on Tuesday night. We are proud to be a corporate partner to this great organization. They are making a difference in so many lives for the people of South Minneapolis. We look forward to our continued partnership with Ace In the City! MINNEAPOLIS, MN -- LogiSolve is excited to partner with Ace in the City to help provide backpacks and school supplies for inner city kids in Minneapolis. Ace in the City is a community development organization focusing specifically on literacy, mentoring, education, and neighborhood engagement. Another Aces All-Star Evening in the books! LogiSolve is proud to support and donate to ACES (Athletes Committed to Educating Students) for the 3rd straight year! Aces is an organization founded by Dr. Rajiv Shah, also the founder of MyMeds, a medication adherence platform. On May 18th, Aces held their annual fundraiser to support the program. Thanks to Dr. Shah and ACES for continuing to be such a positive influence on the children in MN. RONALD MCDONALD HOUSE (OAK STREET) -- RMHC-UM provides a caring and supportive community to families facing a child’s serious medical situation. Financial donations, in-kind gifts, and donations of time and talent contribute to the most important service to provide families –a home-away-from-home full of love, support, laughter and hope. Due to the inclement weather and hazardous driving conditions, we are POSTPONING the Logisolve Holiday party to a future date in January. We will be sending out new information as soon as we secure a new date at the venue. We wish you all a wonderful Holiday and a Happy New Year. Stay warm and safe on Friday! SAINT PAUL RIVERCENTRE -- LogiSolve was pleased to participate in the 2016 Government IT Symposium at the River Centre in St. Paul, MN. Two LogiSolve Practice Leaders, presented in the educational tracks on Team Dynamics (Judy Richardson-Mahre) and Scaled Agile & the Business Analyst (Mel Greenlee). We appreciate the great reception from those who stopped by our booth. Our very own Judy Richardson-Mahre and Phil Almeroth will be presenting at the next PMI MN get together. The topic will focus on career moves and be ready to strike back when opportunity strikes! MINNEAPOLIS, MN -- LogiSolve attended the 4th Annual Mid-America Summer Institute Region 8 Conference this week in Minneapolis, MN. This conference brings together the best healthcare revenue cycle and finance experts from IA, KS, MN, MO and the Dakotas. We were fortunate to be able to share our ideas related to Healthcare solutions and to be able to demonstrate CARS, our custom developed application related to Cash Reconciliation. It was extremely worthwhile and rewarding being a sponsor of this great event! LogiSolve named as a 2016 Best Places to Work honoree by the Minneapolis/St. Paul Business Journal. MINNEAPOLIS, MN -- We are excited to announce that LogiSolve has been named as one of the Best Places to Work for 2016 by the Minneapolis/St. Paul Business Journal! 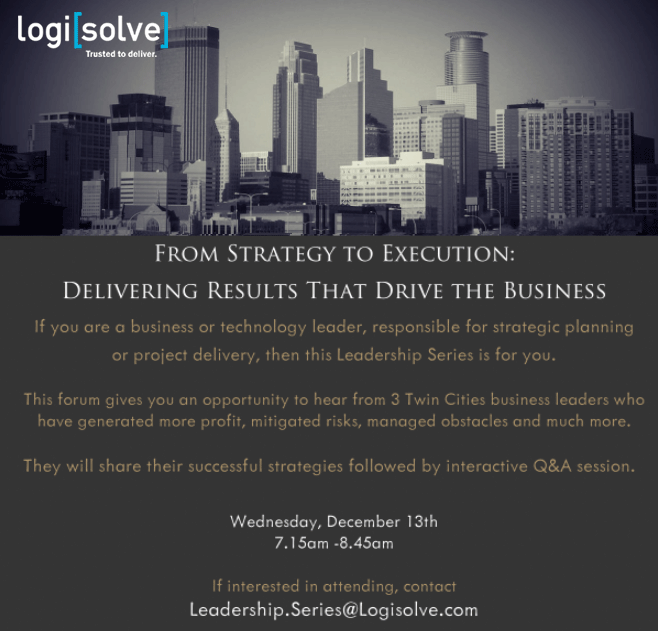 MINNEAPOLIS, MN -- LogiSolve was recently identified as a 2016 Best of Business First Place winner in the category of IT Consulting Firm by Twin Cities Business magazine readers. LogiSolve attends ACES All Star Evening! MINNEAPOLIS, MN -- LogiSolve is proud to support and donate to ACES (Athletes Committed to Educating Students)! Aces is an organization founded by Dr. Rajiv Shah, also the founder of MyMeds, a medication adherence platform. On May 12th, Aces held their annual fundraiser to support the program. Guest speakers were Jeff Locke, the Minnesota Vikings Punter and ACES Mentor and Melvin Carter, Director of the Office of Early Learning at the MN Department of Education. A very inspirational evening. Thanks to Dr. Shah and ACES for being such a positive influence on the children in MN. LogiSolve presents two Scholarships to Chisago Lakes Graduating Seniors! OAKDALE, MN -- Congratulations Everyone! LogiSolve Consulting was just named to the Top 20 List of IT Consulting Firms in the 10/2/2015 issue of the Minneapolis/St. Paul Business Journal!! The list recognizes Consulting Companies that are vibrant growing companies and considered the highest quality organizations in the Minneapolis, St Paul and Greater Minnesota area. Thank you for your quality work and way to go! Over the weekend, LogiSolve sponsored a team in the Susan G Komen Race for the Cure! Also, this month LogiSolve donated to the Shut Out Cancer Blood Drive. LogiSolve will be at PMI’s Professional Development Days on Thursday, September 17, 2015 at the Saint Paul RiverCentre. 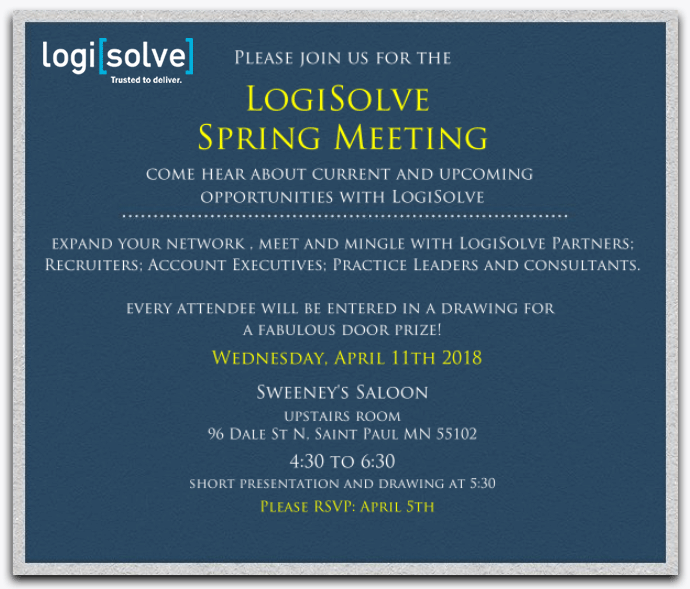 If you are planning on attending the event, please make sure that you stop by the LogiSolve booth to say “hi” to the LogiSolve team! In addition, we will have some great giveaways! We currently have an opening for a Practice Leader for our Quality Assurance/Testing Practice. Our QA practice is a vital growing practice at LogiSolve and we need a leader who not only is recognized as an expert in the QA space, but interested in helping us take the practice to the next level. The primary objectives of the PL role are practice growth, consultant quality, and consultant retention. If you are interested, please contact BK (bksicard@logisolve.com) for a job description and further details. Candidate referrals are a core component of our recruiting strategy. We value the people who are known and highly regarded by the people we know and trust! This is what keeps LogiSolve successfully growing! With the market continuing to be active, we are always looking for referrals. Therefore, please keep LogiSolve in mind if you know of anyone within your network who is currently pursuing opportunities. If we place them, you get paid! In addition, if you hear of upcoming needs at your current client site, please forward that information to the account manager. If we place someone in that position, you get paid! Come join us for a fun evening on beautiful Lake Minnetonka! Our boat for the evening will be the Bella Vista (see picture above). Cruise boards at 5:45 PM and departs at 6:00 PM returning to dock at 9:00 PM. You and a guest can enjoy a lovely evening with dinner and drinks. The remarkable Dirty Birds , aka The Kelly Wendlandt Band, will be providing live music. On April 25th, 2015, a 7.8 magnitude earthquake hit Nepal. When I first heard about it, I wasn’t ready to accept it. Had it been a nightmare I would wake up to make sure that was just a dream? Unfortunately, that was real, and it breaks my heart again and again. This earthquake was a monster. It cruelly devastated lives of Nepalese inside and outside the country. It took lives of thousands of people inside the country, and many were injured severely. Tears didn’t stop as thousands of poor hearts became homeless, and many standing in a line by the holy Bagmati River to cremate dead bodies of their loved ones. With Rescue team unable to reach in rural areas on time, enormous number of people lived/ may be living with no food or water for several days. With this information I would like to introduce briefly about myself. My name is Sanjeev Thapa and I’m currently working for United Health Group through LogiSolve. I work as a Business Intelligence Analyst, and I’m very grateful to LogiSolve for providing me with this opportunity in the area that I am comfortable working. Moreover, the friendly nature of this company and its team is definitely admirable. LogiSolve had reached out to me regarding any help that this company could offer to collect aid to help the victim in Nepal. This was very thoughtful. They have also created a page where you and I can visit and donate any way we can. This is a very difficult time for all of us, especially for us residing outside nation. We are all feeling helpless and worried. Many of us have started donating to different organizations and also supporting in our own way. So please join hands with us to help the victims as every single effort counts. Here’s the link you may find helpful to share any help. LogiSolve is excited to welcome Tim Wenner as Practice Leader for Healthcare / Revenue Cycle Solutions. LogiSolve has enjoyed a long history of working with Tim on several projects and is very excited to have Tim on our leadership team. Tim has over 25 years of experience in the Information Technology industry, 11 of which have been in healthcare revenue cycle leadership. Tim has also lead groups in developing efficient cost of care, streamlining claim processing through automation and managing healthcare organization change. LogiSolve is excited to announce Britney Glader has joined our team as Controller! Britney is currently in the last week of her B.S. in Business Administration program at Saint Mary’s University of Minnesota, and will be attending the University of North Dakota (online) to obtain her MBA starting in the spring of 2016. Prior to LogiSolve, Britney worked as the Accounting Manager for a non-profit ambulance service in Chisago County. In addition to her background in accounting, she has a passion for healthcare and is licensed as an EMT in the State of MN. Britney resides in Wyoming, MN with her husband Jon, her 10 month old daughter Peyton, and her 3 month old puppy, Harley. Britney is excited to join the LogiSolve team! Led by Kent Dicke ,Tim Wenner and Ron Kimlinger-LogiSolve is providing a comprehensive cash management solution to Sanford Healthcare of Sioux Falls, South Dakota. The application, known as CARS (Cash Application/Reconciliation System), provides functionality to greatly ease the process of receiving, posting, and balancing a healthcare organization’s cash receipts. CARS was developed over the past several years through a collaboration between Allina Hospitals and Clinics and LogiSolve to reduce the amount of resources needed to reconcile incoming cash and payer data errors; called 835 payments (the process for correcting the errors involved people manually following up with each payer and was effort intensive). Since implementing CARS in 2009, Allina has increased operational efficiency and reduced expense while improving its ability to reconcile cash throughout all of its facilities-and reduced staff by 20 people (who were reallocated to other administrative areas within Allina). Now that is well defined ROI! Thanks Kent, Tim, Ron, Jenni O’Farrell and the rest of the LogiSolve team for implementing this game-changing solution for Sanford Hospitals and Clinics! MINNEAPOLIS, MN -- LogiSolve participated in the IIBA's 6th Annual Professional Development Days on April 8, 2015 at the Earle Brown Heritage Center in Minneapolis. It was great to see some of our current and past consultants of LogiSolve, as well as, have the opportunity to meet several new individuals! OAKDALE, MN -- LogiSolve is excited to welcome back Lydia Lopoukhine-Hoffman to our leadership team. After working for one of clients for a short period of time, Lydia has returned to lead our Business Analysis Services Practice. Welcome back Lydia! ST. LOUIS PARK, MN -- January 15th, 2015 Steve Barnes was awarded the "Quality Cup" from LogiSolve! Thank you Steve for your outstanding contributions! The LogiSolve team celebrated with Steve at Toby Keith's Bar & Grill in St. Louis Park. ST. PAUL, MN -- LogiSolve is pleased to announce the launch of its Government Services Business Practice. LogiSolve has been providing IT and Management consulting services to State, County and Local government agencies for the last 9 years; and has set up a formal practice to optimize the services that our government clients are receiving. Logisolve is providing project and staff augmentation resources through the ASAP-IT preferred vendor program and the SITE Master Contract program; and is providing services to County and Local government agencies like Ramsey County, Washington County, City of Inver Grove Heights to name a few. MINNEAPOLIS, MN -- Due to client demand and state regulations, LogiSolve has been working on upgrading our ePrescribing Gateway Module to include the ability to perform Electronic Prior Authorization (ePA). This enhancement will allow a EMR to quickly enable the ability to exhange the needed transaction set for the purpose of electronically requesting/receiving prior authorization. As with the ePrescribing modules in the current gateway, this new module will be able to be totally integrated into the EMR to provide a seemless workflow for the physician. ST. PAUL, MN -- LogiSolve is pleased to announce that one of our Senior Project Management consultants, Laura Walters, has been appointed to the position of IT Project Director at MNsure. In this role, Laura will be managing MNsure’s IT Project Portfolio. Laura brings a wealth of experience as a Sr. Project Manager in Healthcare and is excited to be taking on this role. DELLWOOD, MN -- As part of LogiSolve's on-going commitment to Community Involvement, we recently made our annual contribution to Toys for Tots on behalf of our clients. Our generous associates and their family members purchased over $1,900 worth of toys this holiday season. The toys were presented at our LogiSolve Holiday Party on December 8th, 2013. DELLWOOD, MN -- LogiSolve held it's annual client golf outing at Dellwood Country Club on September 12, 2013 with over 50 of our valued customers and LogiSolve team members. We are proud to announce we were able to raise over $1,200 for the University of Minnesota Cancer Center through donations from our clients and LogiSolve team. BLOOMINGTON -- LogiSolve is pleased to announce that we will be participating in the e-Health Summit hosted by the State of Minnesota- Department of Health, on June 13th at the DoubleTree Hotel in Bloomington. We will have a booth at the event and invite you to stop by if you will be attending. BLOOMINGTON, MN -- Mark your calendars for a LogiSolve Open House Wednesday, February 27th, from 4:00 to 7:30 pm at Cowboy Jacks in the Jesse James room. Appetizers and drink tickets will be provided. TWIN CITIES, MN -- LogiSolve has made the necessary enhancements to the current gateway module to now be compliant with the latest approved NCPDP standard - 10.6. This module has been purchased by our client to quickly become certified with Surescripts for the purposes of sending electronic prescriptions, viewing medication formulary information, and downloading medication history. DELLWOOD, MN -- As part of LogiSolve's on-going commitment to Community Involvement, we recently made our largest contribution yet to Toys for Tots on behalf of our clients. Our generous associates and their family members purchased over $2,500 worth of toys this holiday season. The toys were presented at our LogiSolve Holiday Party on December 3rd, 2011. MINNEAPOLIS, MN -- Allina Hospitals & Clinics has entered into an agreement with LogiSolve Consulting to provide a comprehensive cash management solution to other healthcare organizations. The application, known as CARS (Cash Application/Reconciliation System), provides functionality to greatly ease the process of receiving, posting, and balancing a healthcare organization’s cash receipts. ST LOUIS PARK, MN -- Mark your calendars for a LogiSolve Open House on Wednesday, March 9th, from 4:30 to 7:30 pm at Toby Keith’s I Love this Bar & Grill. Appetizers and drink tickets will be provided. Logisolve Donates Time and Resources to Create the ShannonOpen.org Web Site. MINNEAPOLIS, MN -- The Shannon Open was started in 2006 by the family and friends of Shannon Harris, a 17-year-old Highland Park resident who attends Cretin-Derham Hall High School. Shannon was diagnosed with Cystic Fibrosis (CF) when she was 2 years old. The Shannon Open has generated over 100,000 dollars to the CF foundation. MINNEAPOLIS, MN -- LogiSolve Consulting, the Minnesota leader in Management and Technology consulting, is pleased to announce that the company was ranked 4th in the Minneapolis-St. Paul Business Journal 2008 Growth 50, a list of the 50 fastest-growing private companies in the Twin Cities. MINNEAPOLIS, MN -- LogiSolve was named today as the 378th fastest growing private company in the United States according to Inc. Magazine. LogiSolve was also ranked #47 nationally among IT Services firms. CHISAGO CITY, MN -- Neil Taurinskas from Chisago Lakes High School is the winner of the 2008 LogiSolve Scholarship. Neil has maintained a GPA of 3.927; 11th out of 275 graduating seniors at Chisago Lakes High School. Neil will be attending the University Of Minnesota Institute Of Technology with Mathematics major in the fall. EAGAN, MN -- As Thomson Reuters continues to evolve their program and operate as one national Adecco Solutions Thomson Reuters MSP, they are taking steps to differentiate their suppliers to create a two tier structure. To determine the tier status of a supplier, they reviewed individual supplier activity for the past 18 months on factors such as compliance, submittals, interviews, hires and spend. DELLWOOD, MN -- In the spirit of the Holidays, LogiSolve donated over $1,000 of gifts to Toys for Tots on behalf of our Clients and Associates. Not to be out-done, our Associates attending the party individually purchased another $1,000 of gifts. What a generous set of matching gifts to a very worthwhile cause!! 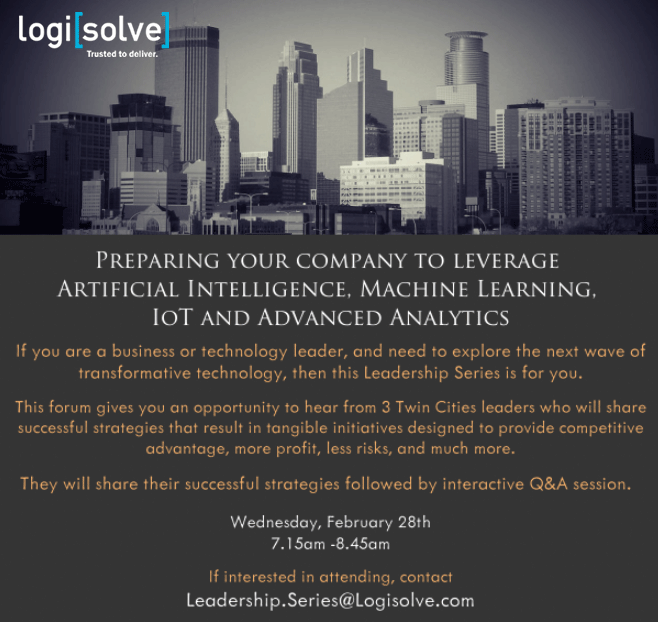 MINNEAPOLIS, MN -- LogiSolve Consulting, the Minnesota leader in Management and Technology consulting, is pleased to announce that the company was ranked 1st in the Minneapolis-St. Paul Business Journal 2007 Growth 50, a list of the 50 fastest-growing private companies in the Twin Cities. DELLWOOD, MN -- In the spirit of the Holidays, LogiSolve made a small donation to Toys for Tots on behalf of our clients. The toys were purchased by LogiSolve family members and are presented at our LogiSolve Holiday Party here by Tom Newman. Luckily, the site of our party (Dellwood Hills GC) is also a Toys for Tots drop off site for the Marines who picked up the toys the very next day! MINNEAPOLIS, MN -- Wednesday, September 20th is our next seminar in a series of industry lectures to be held at the LogiSolve office over the lunch hour. The seminar “Agile Software Development” will be led by Ken Pronovici. MINNEAPOLIS, MN -- Achieve HealthCare Technologies has received a grant from CMS to study the effectiveness and applicability of the NCPDP standards and workflow associated with electronic prescribing. Achieve has engaged LogiSolve to assist with the design and development effort required to bring the current Achieve Prescribing tool to be ePrescribing enabled. Achieve approached LogiSolve after learning of LogiSolve's past experience implementing similar solutions in the health care industry. GOLDEN VALLEY, MN -- LogiSolve's Tom Newman was recently featured on KARE 11's "Prep Sports Extra - Where are They Now" segment with Randy Shaver. The featured aired on December 5th, 2005 during the 10:00 PM CST newscast. MINNEAPOLIS, MN -- LogiSolve is happy to announce that it has decided to match LogiSolve consultant contributions to the Hurricane Katrina Disaster Relief Efforts with a dollar for dollar match, up to $5,000. ATLANTA, GA -- Amid national calls to improve patient safety through electronic prescribing, McKesson has further strengthened its leadership with complete, end-to-end connectivity in the prescription writing process. Through relationships with RxHub and SureScripts, McKesson is the only company to offer comprehensive e-prescribing solutions integrated with its ambulatory electronic health record (EHR) and retail pharmacy solutions. These powerful e-prescribing assets enable McKesson to fully connect physicians, patients, pharmacy benefit managers (PBMs), and retail pharmacies to drive community-wide efficiencies, cost reductions and improved patient safety. MINNEAPOLIS, MN -- LogiSolve was a proud donor to a fundraising event for the families of the victims in the Ramsey gas explosion which occurred in late December 2004. LogiSolve donated items valued over $2,000 that will go directly to the children who lost their mother in the tragic event. WASHINGTON, DC -- HHS Secretary Mike Leavitt today announced new proposed regulations that will support electronic prescriptions for Medicare when the prescription drug benefit takes effect in January 2006.